Goalie Daniel Collins was named to the Catholic High School All League Hockey Team. Daniel was honored during the Catholic League Showcase Game on Sunday, February 22nd. 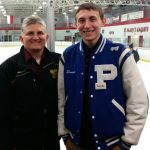 Parkway Christian participates in Hockey with Bishop Foley’s United Team. Congratulations Daniel! The Parkway Christian Cheer Team advanced to the Regional Competition, by placing 4th place in the District Competition. The Regional Competition will be held at Mason High school on Saturday, February 28th at 6:00 PM. Come out and support our Lady Eagles! Parkway’s boys basketball team defeated a tough Detroit Westside Christian to move to 10-5 on the season. To view the Macomb Daily write up, click here. The Girls Varsity defeated Macomb Christian by a score of 50 to 32. The Eagles move to 8-1 in conference play. Click here to see the Macomb Daily write up of the game.